Care On Demand – Are YOU Ready? While driving down 95 last week, I noted a billboard advertising Care on Demand from a large hospital system in South Florida. I wondered what the services were about so when I got home, I looked it up online. Care on Demand is a program where people can be seen on demand over the internet by a doctor or nurse practitioner. The cost of a visit is $59.00 for a primary care visit and $99.00 with a psychologist or $129.00 for a psychiatrist. All you do is download the app onto your phone and choose a service and a provider and begin talking. It is a convenient system and a way to allow people to access medical/behavioral healthcare 24/7. I did not download the app as the program is run by a healthcare system that I am not associated. But it made we think, would I want to receive care this way? Is this the wave of the future? Are people prepared for this type of technology? Is it safe? Then I thought back to a recent visit with my Primary Care doctor for my annual physical. After registering, I was taken to the triage nurse where my blood pressure, pulse, and weight were taken. The nurse did not give me the results but talked mostly about her mother’s upcoming visit. After she finished with me, she told me to wait in the waiting room for another nurse to call me to see the doctor. I waited for about 20 minutes to be called in to see the doctor. Once in the room, I waited another 10-15 minutes for the doctor to come into the room. She finally came in and asked me how I was. She then re-took my blood pressure as she said it was high at 145/80. The second reading came down, but it was still elevated. 130/80. She said that she wanted me to take it at home and if it continued to be high, she would start me on some medication. She sat down and looked for my record on the computer and asked me how I was doing and if I had anything to ask her. I told her I needed a script for my mammogram. She looked up to see when my last mammogram was and said to me that it was over a year and I was due for another one. She said she would put the order in and I could make the appointment at the desk when I checked out. I asked about a pap test as that was also due. The doctor asked me how old I was. I told her 64. She said that I did not need to get them anymore as all my pap test have been normal and the new guideline say that if Pap test have been normal those over 60 do not need to get them any longer! This was a surprise to me – and it made me feel old. She reviewed my lab work and noted my cholesterol was high and ordered medication. She asked me if I had gotten the flu shot and the pneumonia vaccine and I told her yes. She said me she wanted to see me in 3 months to re-check my cholesterol and blood pressure. I left the office feeling I got what I went there for….but felt something was missing. As I was waiting for my husband to pick me up, I thought about the billboard for Care on Demand. I felt that the visit I just had could have been done virtually as it was a very routine exam. Did I really need to be in the same room as the doctor? Today, the technology is in place for me to take my blood pressure while with the doctor on the screen so she could see the reading herself. Technology also allows the doctor to listen to my lungs and exam my skin by turning the monitor as needed. It is a learning curve, but routine visits could be done virtually! It made me sad as I always expect more. I expect the doctor to get to know me, to care about me and to help me address health challenges, so we prevent problems from occurring. Can we have meaningful visits virtually? Maybe we can as both parties will have a little more time to learn about and from each other. So maybe I will look into Care on Demand. It would be more convenient for me. I know that the key to on-demand care is to be prepared going into an appointment. Have a list of questions for the doctor so you can get what you need. I realize that this puts more responsibility on me as the patient and makes me more accountable for my health and healthcare. Something to think about for sure. Have you received Care on Demand? If you, what was your experience? Did you feel ‘taken care of’? Were your questions/problems resolved? What was your experience? Please put a note in the message box as I am curious how this new technology is working. What a thought-provoking post. Definitely pros and cons to this I want to have a relationship with my caregivers more often than not. 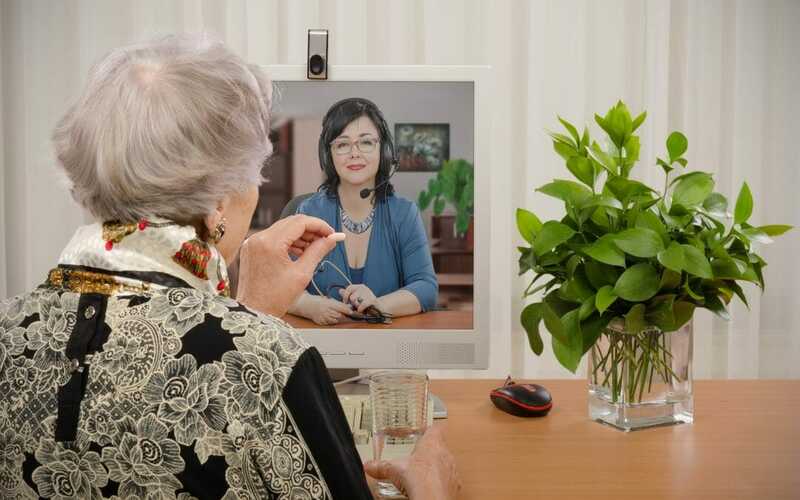 In my own vision of telehealth it seems important to have some F2F connection at some point and yet maybe not all. It will be interesting to see how the future unfolds. I had a similar appointment with my nurse practitioner last week and since I have a high deductible plan, spent $130 for something I could have done virtually. I believe in an era of primary care provider shortages this is a valid solution. Jeff, I think Patient Advocates will play an important part of Telemedicine. Patients will need help more than ever. As one who received a Certificate of Professional Achievement in HIT from Columbia U., I see both advantages and disadvantages to the current technology being used to improve healthcare services. It is new enough that we still need study and monitor the cost/benefit ratio of technology and ultimately decide how it can best be used in delivering healthcare. I don’t see that the “peace of mind” factor that all of us are looking for can be supplied by any modern technology that has been developed to date. The education industry is light years ahead in utilizing technology in the delivery of educational services. That’s just history. We can learn much from their achievements in this area – maybe even more from their disappointments. A recent conversation about hospitalists was similar. They don’t know the patient but so often the primary care doctor really doesn’t either. Many people don’t realize that it may not be that bad when we tell the doctor what we need from them instead of them telling us what we need. With so many specialists now having one doctor to write a script to see a specialist can work well. covered by various insurance plans. maybe covered by Medicare as well. an article discussing the above. Yes, I can see where you probably felt a bit like you had to orchestrate your own appointment. Because you are a nurse you can keep on top of needed diagnostic tests but the average person cannot. I am a strong advocate for recognition of the clinician/patient relationship as an important factor in health outcomes. The patient is not a broken machine and the clinician is far more than a technician. Care is essential in the healthcare encounter. It can not be delivered solely through mechanical/technical means. That does not mean that a face to face encounter between a patient and healthcare professional will necessarily include human care and attention. From your description, I don’t think your appointment with your doctor demonstrated much more ‘care’ than you might have had from (Amazon’s) Alexa . Kathy, thanks for commenting. You are right on…..I think Alexa might have been more responsive actually!